I've written a script to replace gmeasures. It's purpose is to convert the common units quickly and accurately. It will show in start menu along side the calculators. It would be flexible so any programmer could modify it. It is gettexted. 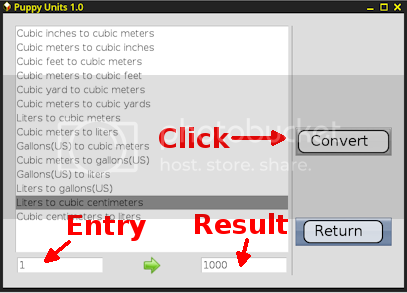 Then select a conversion and enter a value. Click 'Convert'. of the program however it's still quick enough. and puppy will remember the factor. I would appreciate people installing version 1.5 and giving it a test. Please report to me. Is it fast enough?? Any mistakes in conversions?? Contact me if you want to translate script using momanager. It should be quite easy. albeit time- consuming. Then install dev SFS package and then launch momanager. Send mo file to me for inclusion. so if $VAR is not set, it will display "default_value"
after a few months here is the Italian translation. For some reason the Convert button isn't colored. I'll have to look into that. - Fixed minor mistakes in Italian translation thanks to Xanad. For some reason, the illustration in post # 2 above got lost. conversions and math. These are from the latest version, 2.2.